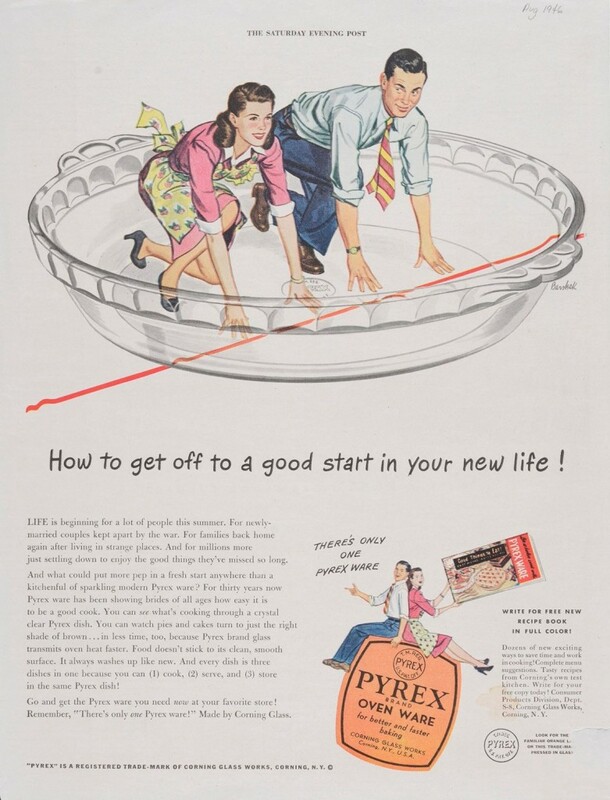 Many of these Pyrex advertisements date from the 1940s and 1950s, a time when the perception of the ideal American home included a white picket fence, a husband who brought home the bacon, and a wife who could whip up a tasty casserole on demand. 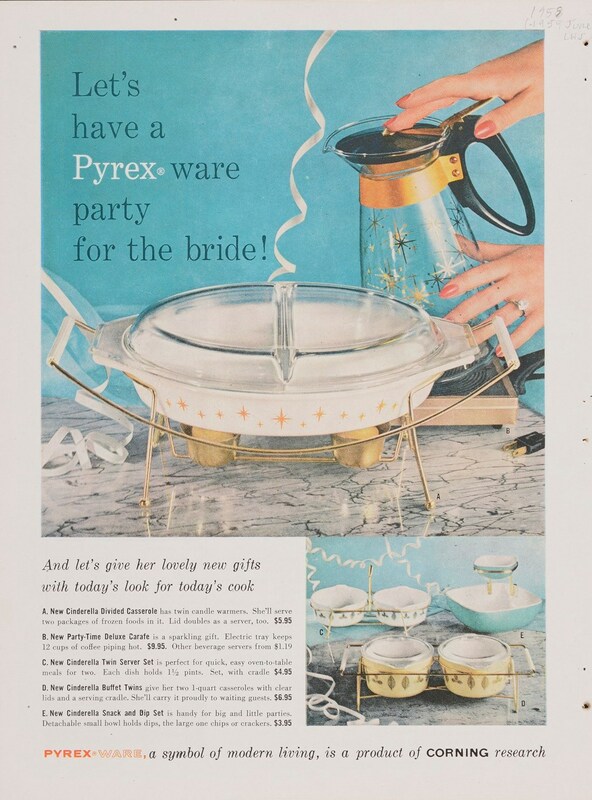 The ads capitalized on this version of the American dream, demonstrating how a kitchen full of Pyrex could help young brides and housewives cook like pros. 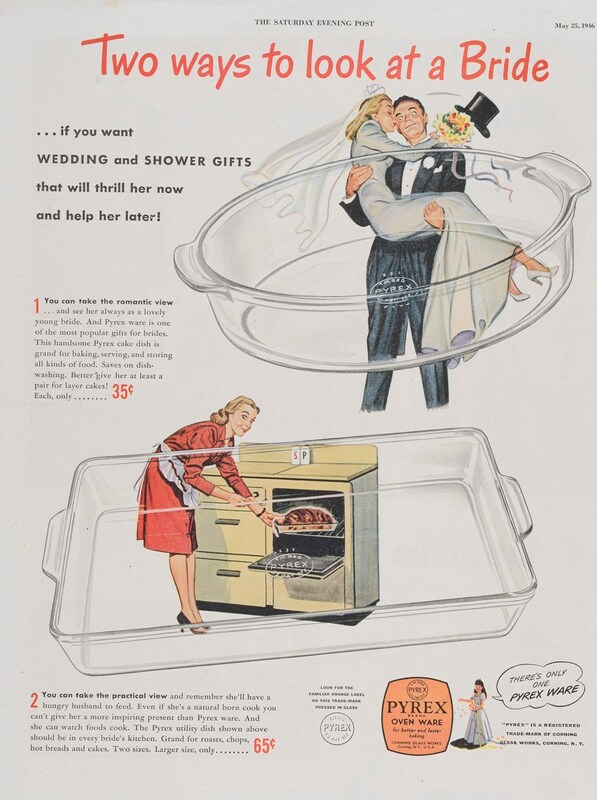 In today’s American family, where partners are often equal in breadwinning and bread baking, we’d like to think that women and men both appreciate a great casserole set. Printed in Ladies’ Home Journal, June 1958. CMGL 140921. What more could a bride ask for? Printed in the Saturday Evening Post, May 1942. CMGL 139764. “Sparkling like her new diamond” – and more handy too. Printed in the Saturday Evening Post, May 25, 1946. CMGL 139762. So get her at least two of everything. Printed in Hardware Age, May 28, 1925. CMGL 140422. Fewer dirty dishes make for a happier bride. Printed in the Saturday Evening Post, August 24, 1946. CMGL 139853. We certainly can’t think of anything better. Printed in Ladies’ Home Journal, June 1959. CMGL 98282.
Who needs an oven when you have a freezer and Pyrex? Printed in 1952. CMGL 98314. And all for a thrifty sale price! Printed in the Saturday Evening Post, November 2, 1946. CMGL 139136. Which is, of course, everyone’s prime goal in life. Printed in 1947. CMGL 140175. The smart man gives all the women in his life Pyrex. Printed in Better Homes & Gardens, June 1945. CMGL 140777. Because who wouldn’t fall in love with a dish (or a husband) that “washes sparkling clean in a jiffy”? America’s Favorite Dish: Celebrating a Century of Pyrex is on view at The Corning Museum of Glass through March 17, 2016. 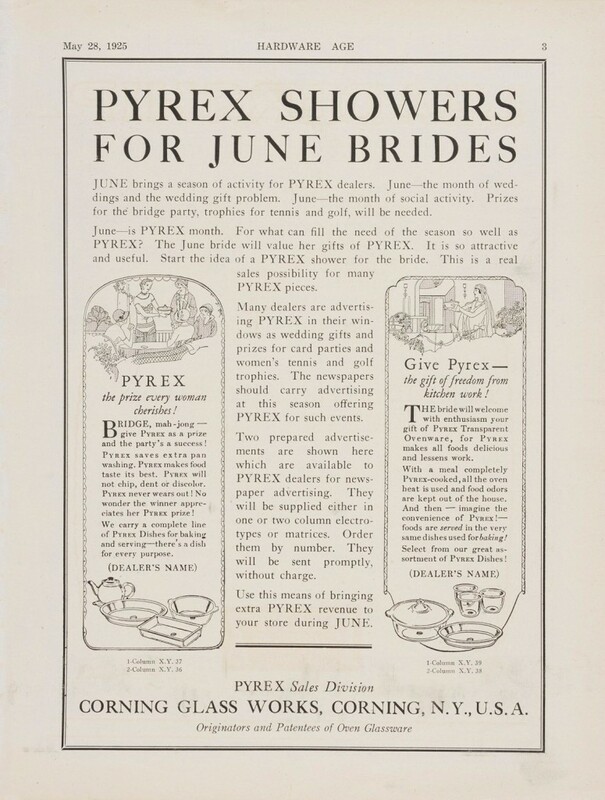 The exhibit commemorates the history of Pyrex brand housewares, developed by Corning Glass Works in 1915. 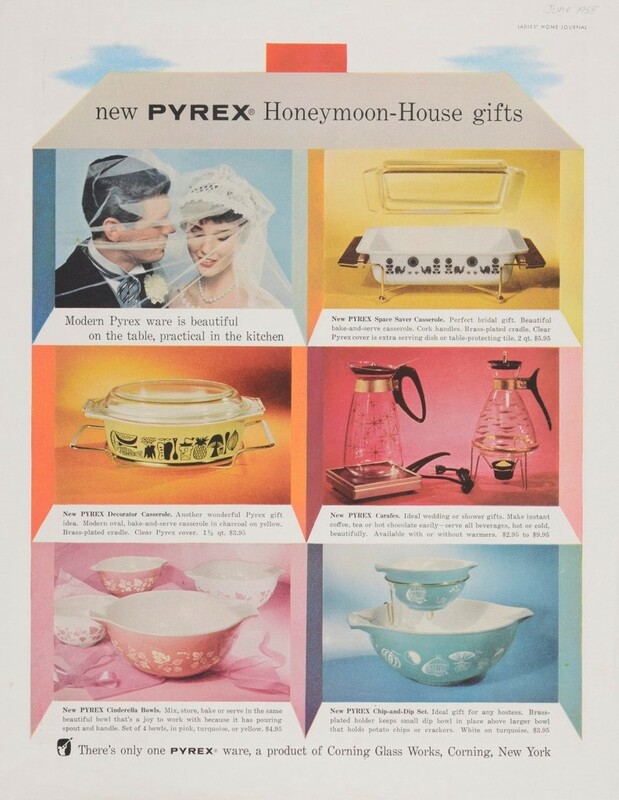 Central to the story of Pyrex are women, traditionally the keepers of the home, who helped Corning designers and engineers develop the products to appeal to the burgeoning women’s consumer market. Corning Glass Works combined affordable products and attractive designs with strategic marketing to make Pyrex a mainstay in American homes. 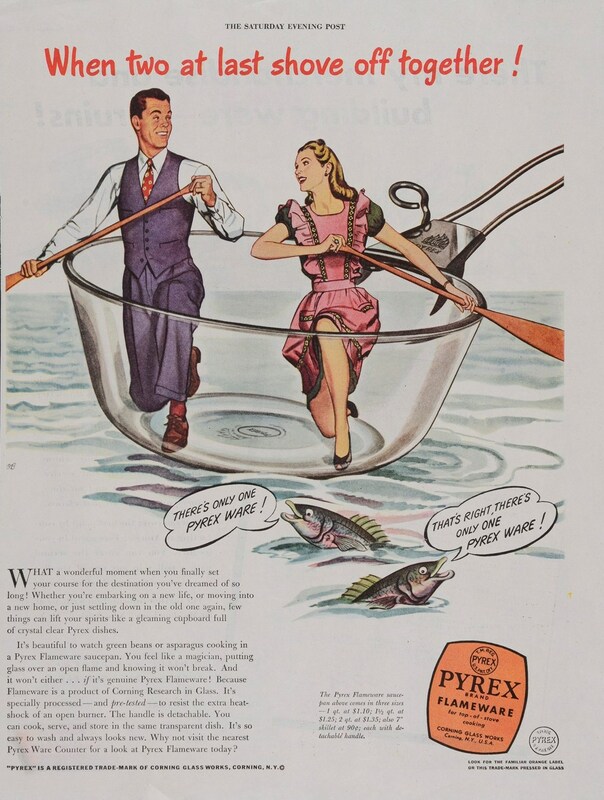 Pyrex advertisements, ephemera, and glassware from the combined collections of the Library and Museum will reveal the evolution of this modern American tradition. 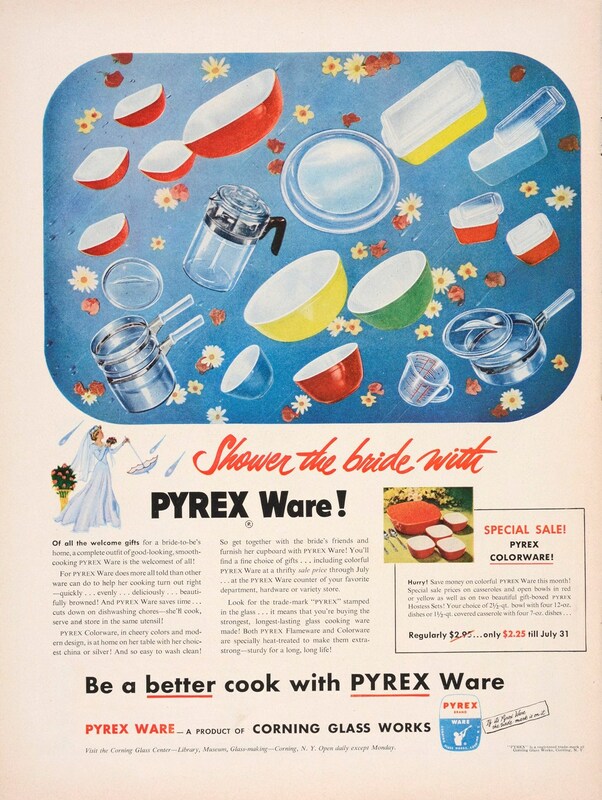 Find Pyrex patterns, recipes and the Pyrex Research Room on Pyrex Potluck.